Everything goes with jeans, right? 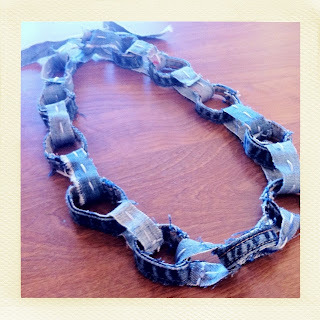 This denim necklace takes that a step further as not only does it go with anything but it really makes the outfit as well. Simple, artsy, and comfortable it really is a delight to wear. I love how it looks paired with my new denim cuff and a sweater vest. 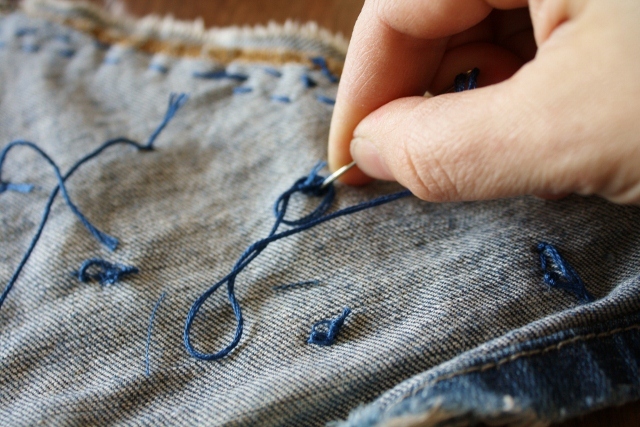 Again, super simple to make, I used only some embroidery floss and strips cut from my painter's jeans. 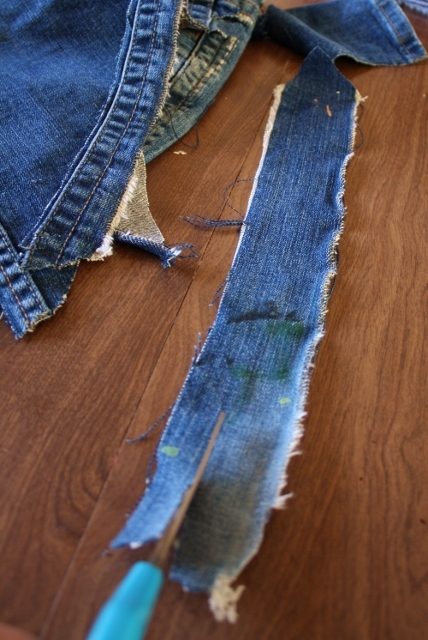 After this project which uses much of the pant legs, I have to admit the jeans have started to look pretty worked over. Still, I've the fabric from one more pant leg, a couple of pockets, and a waste band left to play with, and this is where the challenge starts to get really interesting. 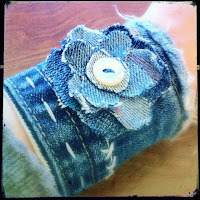 :) Tomorrow- the cutest little denim ring EVER. 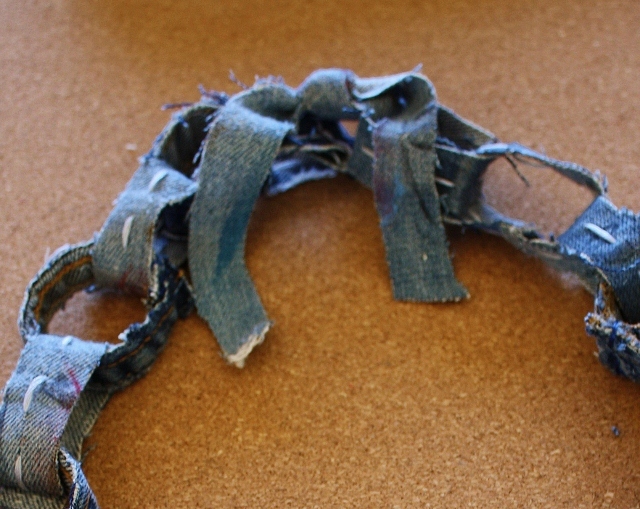 Of course it's the only denim ring I've ever seen so I have to admit the competition isn't that stiff. Still- I'm sticking with it, because it is seriously the cutest denim ring EVER! 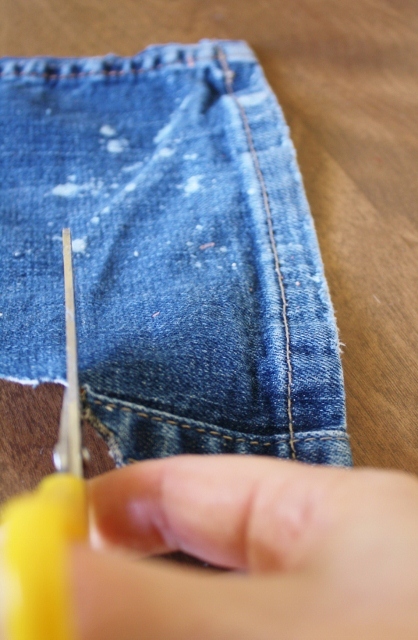 Step One: Cut along the inseam of one of the pant leg you should have left yet after the other tutorials. 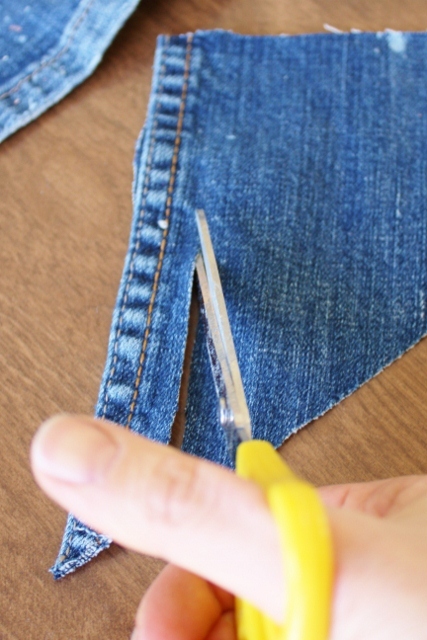 Cut as long as a strip as you can and trim as close to the seam as possible. Then cut this strip into pieces approx. 4 inches in length. I cut 10 strips to create the rings for my chain. 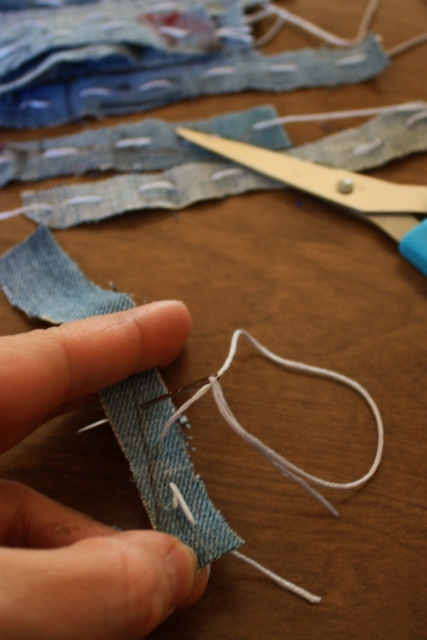 Step Two: Create a ring form from the strips by overlapping the ends just slightly and then stitching it closed with your dark blue embroidery floss by first piercing and then stitching around the edges of the two pieces. Once securely joined, set aside and repeat with all your loops. 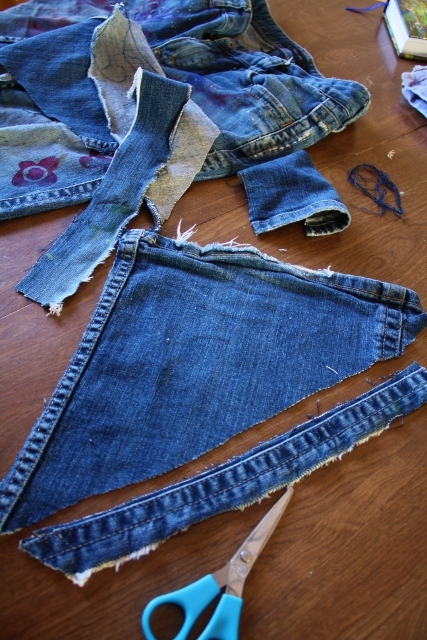 Step Three: Next, from the front or back fabric of the jeans cut several strips approx. 3/4inch in width and as long as you can. Cut these strips down into pieces that are approx. 4 inches long. Make 12-14 of these. I made more of these then I did the strips that were cut from the inseam because I ran out of inseam. To make the necklace the length I wanted I stopped alternating the two different rings and added extra of these plain fabric strips from step three. The finished length of the necklace is up to you- mine is 34" in length. Step Four: Knot the end of a piece of the light blue floss and starting at one end of a strip, straight stitch up the middle until you reach the end. Leave about 2-3 inches excess floss hanging. 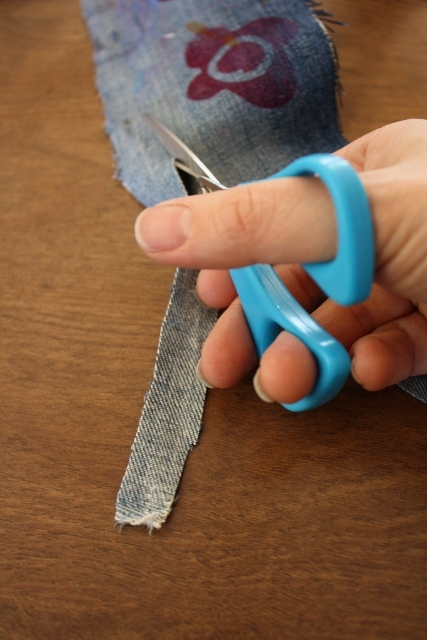 Repeat with all your fabric strips. Step Five: Now you're ready to begin building your chain. 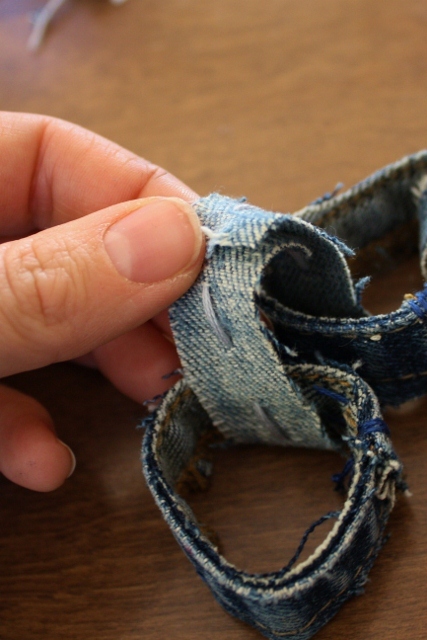 To do this, pick up one of the fabric strips and thread two of the closed denim loops onto it. 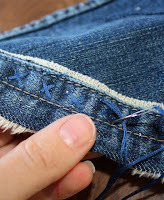 Then wrap up end up and around and use the excess floss stitch close your strip to form a ring as you did in step two with the inseam pieces. Repeat this step until you've run out of rings or strips, or until the necklace is the length you desire. 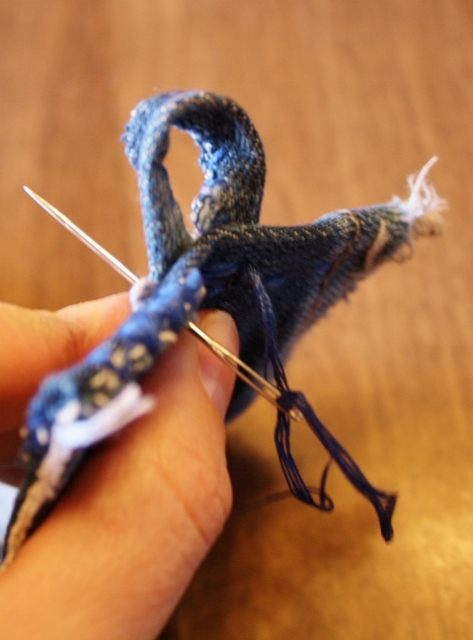 Step Six: For a closure you have a couple of options, you can simply connect the two ends to create a closed chain or you can use something else to join them, like a strip of ribbon. 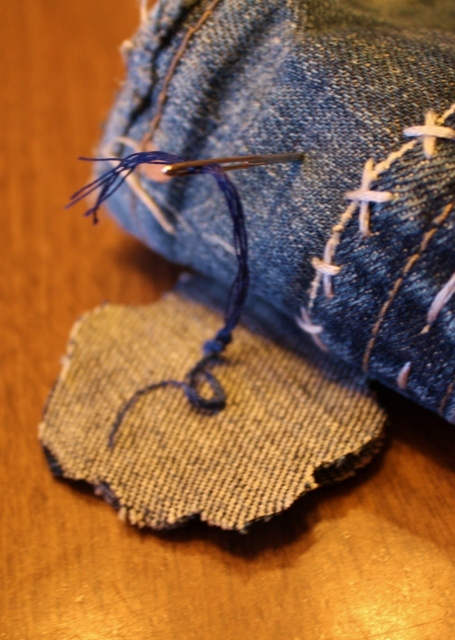 Because of the parameters I set originally for the challenge I decided to join the two ends with another strip of jean fabric. 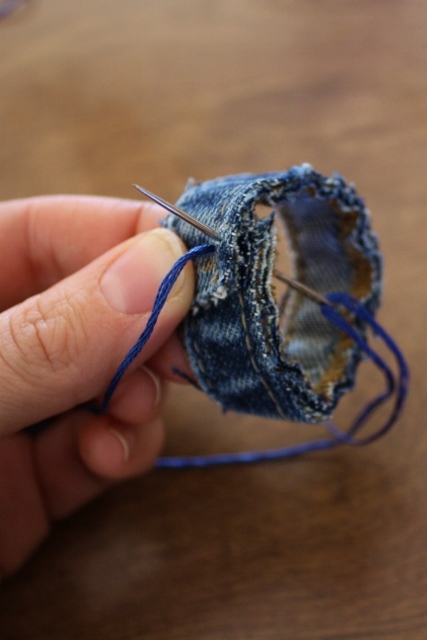 Step One: Begin at bottom of pant leg. Cut just to side of the outer seam about 11 inches. 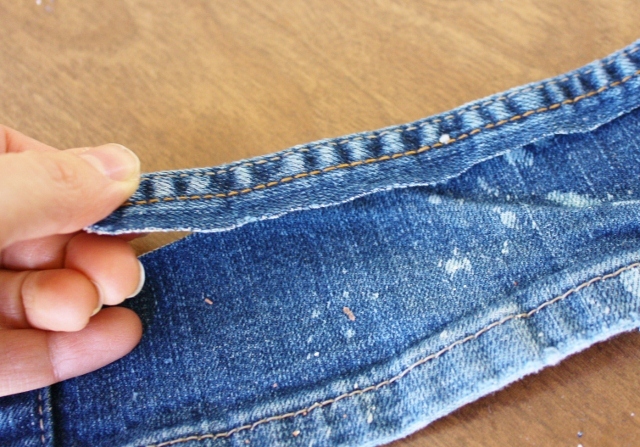 Then measure about 11 inches across at bottom of pant leg and cut from point to point to create a triangle. Set aside. 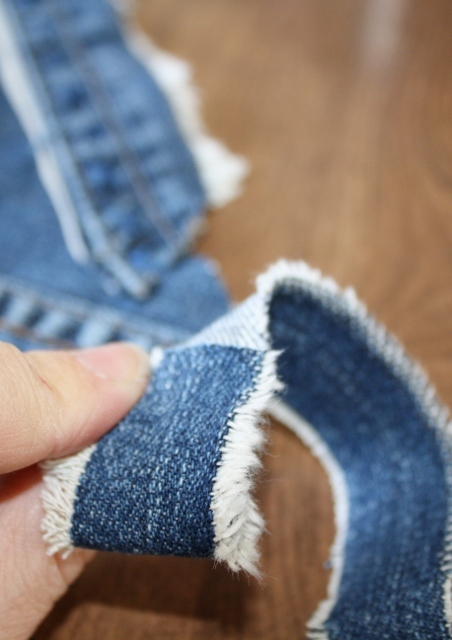 Then, cut jeans along pant seam again to get a strip that is approx. 15 inches in length and about 1 1/2 inches in width. 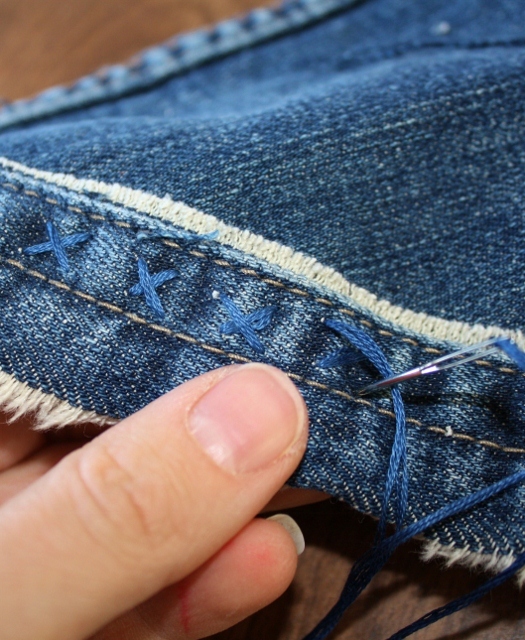 Pull strings at edges to accentuate fray, if desired. 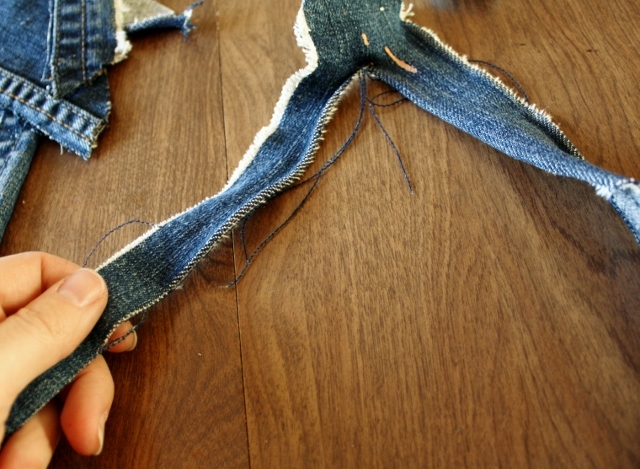 Step Two: Cut a strip from jeans that is about 12 inches long and 2 inches wide. 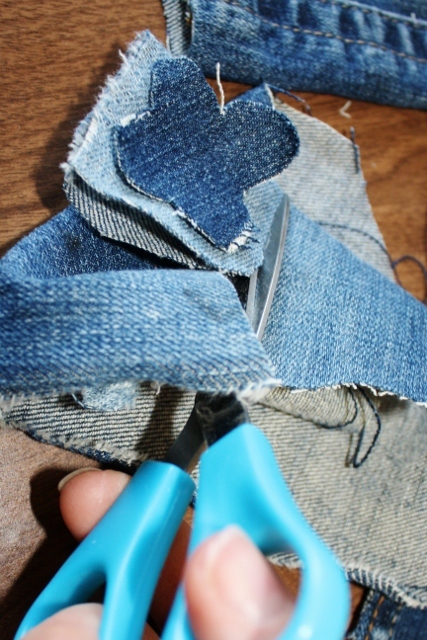 Make small cut in and then tear in half width wise to form two strips that are 12" x 1" in size. These will be the tie strings for the head scarf. 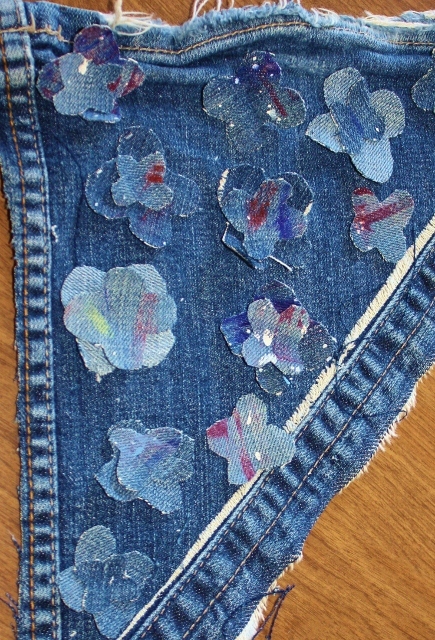 Step Three: Cut some denim from the leg of your pants to use for the flowers. Then free cut a small flower that is approx. 1 1/2" in diameter and use that as a template to cut about 8 more. Then cut 2-3 that are 2" in diameter and about 9 that are about 1" in diameter. Finally cut about 4 that are approx. 3/4" in diameter. 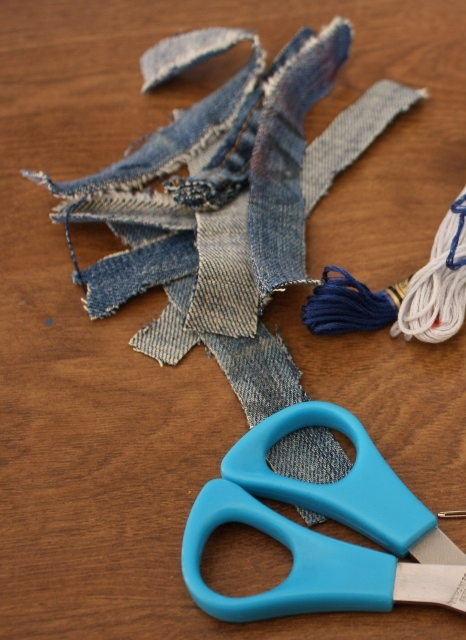 It makes the cutting process easier if you stack your pieces of fabric and cut several at one time. Really you can cut as many of these that are any size or shape that you want, but these are the approximates of what I did. Set blooms aside. you cut in step one to the raw edge across the length of the triangle. You can straight stitch or create a decorative stitch like the cross stitch I'm making at left. Step Five: Then bend over the end of the strips you made in step 2 about an inch and stitch one to each side of your scarf to create the ties. 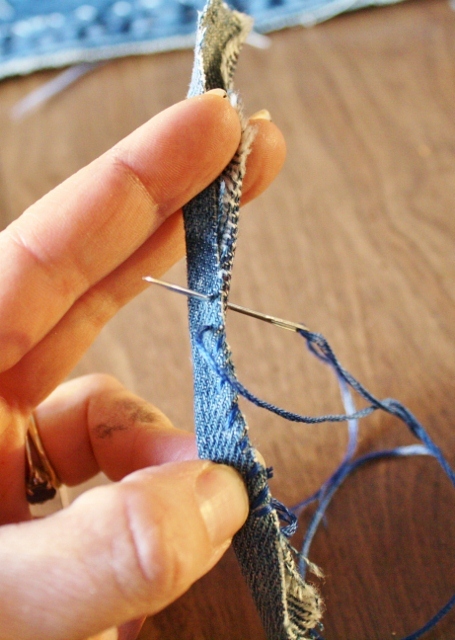 Doubling over the fabric like this before you stitch it to the end just adds a little more thickness and strength to the connection point. 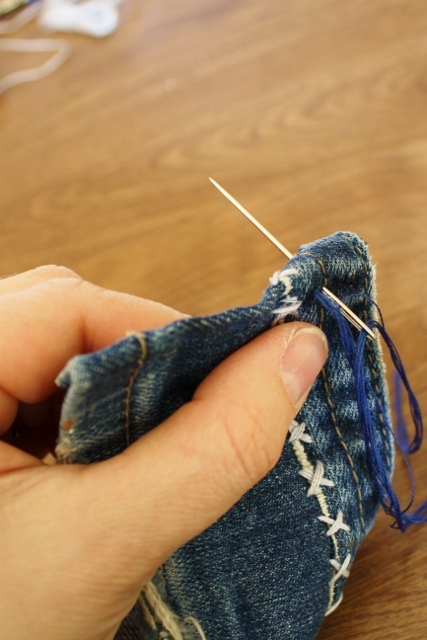 Stitch securely to end using embroidery floss and needle, going over your stitches as many times as necessary for a strong hold. Step Six: Stack different sizes of your cut flowers and position on headscarf as desired. I'll often make little adjustments in placement or size of the bloom and then take a photo of the layout before stitching the blooms in place. That way I have a handy dandy little reference to look back at in case the blooms don't seem to fit as well as I sew them on individually. 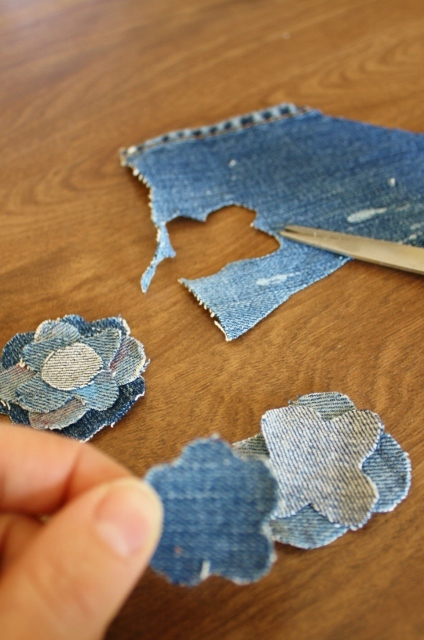 Step Seven: Select buttons for the center of each bloom and then remove all flowers carefully to side. 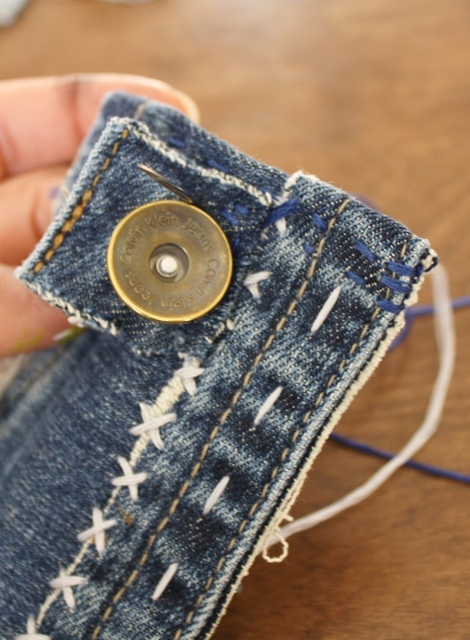 Place one in position on scarf, and then using floss and a needle come up from underside of floss and go up and through the layers of flowers, through the button, and then back down. Repeat a couple of times before knotting off on underside. 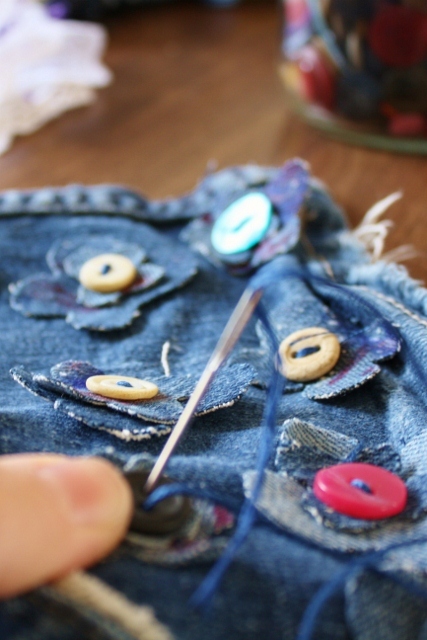 Continue to stitch on flowers until all blooms are secure fastened in place. All Done! Now put it on and show off your handiwork- I'm sure it looks great and you look fabulous! 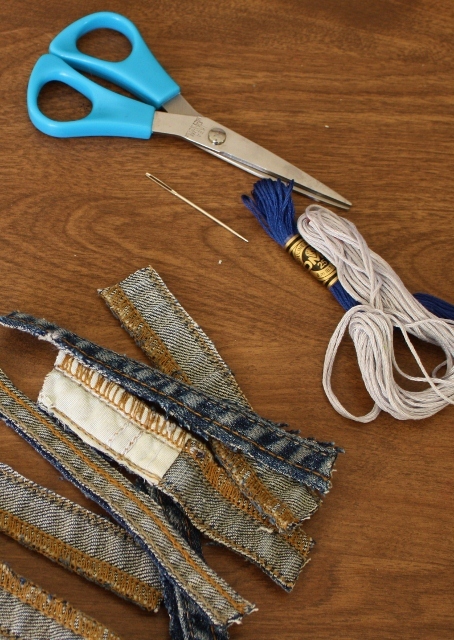 P.S.-I hope you enjoyed this tutorial and stay tune for more jeans tutorials (I've got a cuff and necklace done and am working on a few more- all from the same pair of jeans)! Gotta love that! I reached a peculiar milestone a few days ago. I hit my storage limit for pics on blogger. Apparently I was uploading them in much too large a file or format or something. And because of the large of amount of tutorials I do there are a TON of pics saved here. Oops. So until I figure out if I'm going to go back and resize things (total pain in the neck) or splurge and pay the $5 a year, I haven't been posting. For some reason it completely seems wrong of me to write a post without pictures. I know people do it all the time but it's not my usual and it really makes me fairly uncomfortable. So tonight, in a stop gap measure of sorts I went through a ton of old posts looking for one's to delete. I'm thinking of it as a curating sort of task as well as a practical one. I know that many of my posts were me just speaking to the moment. "This is where I am, what I'm doing, etc. etc." A few repeat themselves, but all in all it was hard to find posts I was willing to part with. This blog has been such a labor of love for me, as your blogs are for many of you too, that I see value in my being able to look back and see where I was a few years ago, even if those of you who are here today aren't likely to wade on back through the archives and read all 380+ posts. As an artist one of the things we're supposed to have is our own personal style. But it's one of those things that I've wondered about in the past. Is that "style" something we develop over time? Is it our interests+abilities that equals our style? If I think about the "styles" of some artists I think of the artists that have been associated with a particular "ist". Such as the expressionists, impressionists, surrealists... if you look at any of their art you can usually identify what they're associated with. But those were more movements weren't they? They were a group of artists pursuing a certain goal through the visual arts. The impressionists wanted to record the actual impression the world makes on us. If I remember right, they were reacting to the camera and the ultra realism that it captured.The expressionists were all about the visual revelation of their emotions. Often the artists of a movement would be congregated in a certain geographic area or "school". And even the artists within a group would differ according to things like their favorite color choices, their favorite subject matter, their favorite way of applying paint or creating a composition. So all of these things would help us describe their personal style. How would you describe yourself? Some think that knowing your own style is one of those pre-req's for being a "real" artist. Perhaps you even think so yourself. Maybe you don't consider yourself an artist because you feel like you flit from one interest to another so easily. I don't believe that though. I believe that each time you create something it has some part of your own style in it. So each time you create something you're creating a clue for yourself. The answer to what your personal style is will be found in your body of work. So it is necessary to make stuff. It is necessary to try new things. Try creating art in the style of someone else and you'll discover that some of it may fit but others may not, it's a good exercise. You might love the colors you chose but dislike the process. Or love the medium but dislike the subject. None of these things ever need to be definitive either. What you love can change. One of the things I like best about researching a particular artist is seeing how their style changes over time. Picasso went through so many different periods in his career it's dizzifying (maybe not a real word but descriptive). So it's ok to struggle to define yourself, it's ok to try different things, it's ok to change things up. Just make stuff and sooner or later you'll discover that you do have definite likes and dislikes, preferences and loves and because you're unique all of these things will add up to your own personal sense of style. But please don't think it's a pre-req to be an "artist". 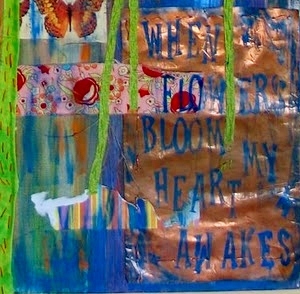 I'm thinking about all of this because I'm trying to incorporate the mixed media work I've been doing into my own style. Some of this is instinctive, like the colors I choose. But what I'm making still feels a little "off" if you know what I mean. So the last few days I went back to my more familiar subject matter (flowers) and colors (vivid) but used the mediums and techniques I've been playing with recently. 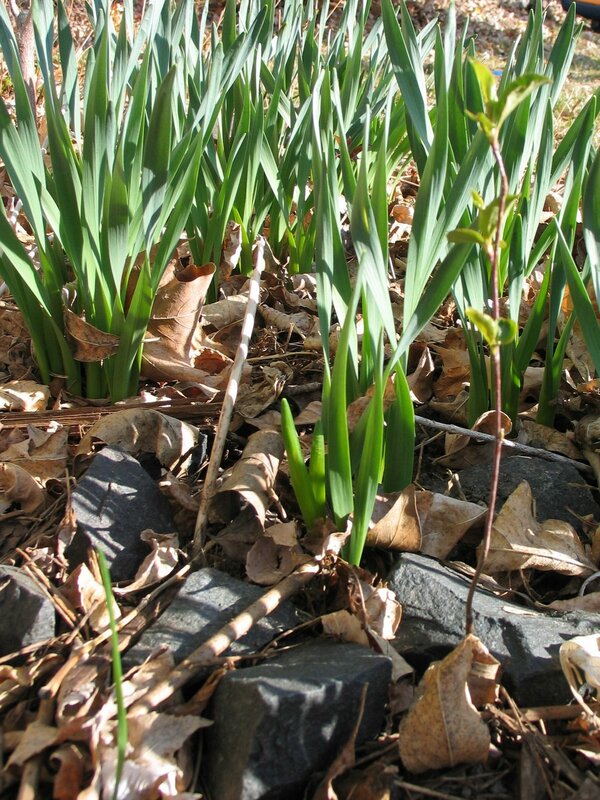 The result is the daffodil piece at top. Do you know your style? Or are you still figuring it out? 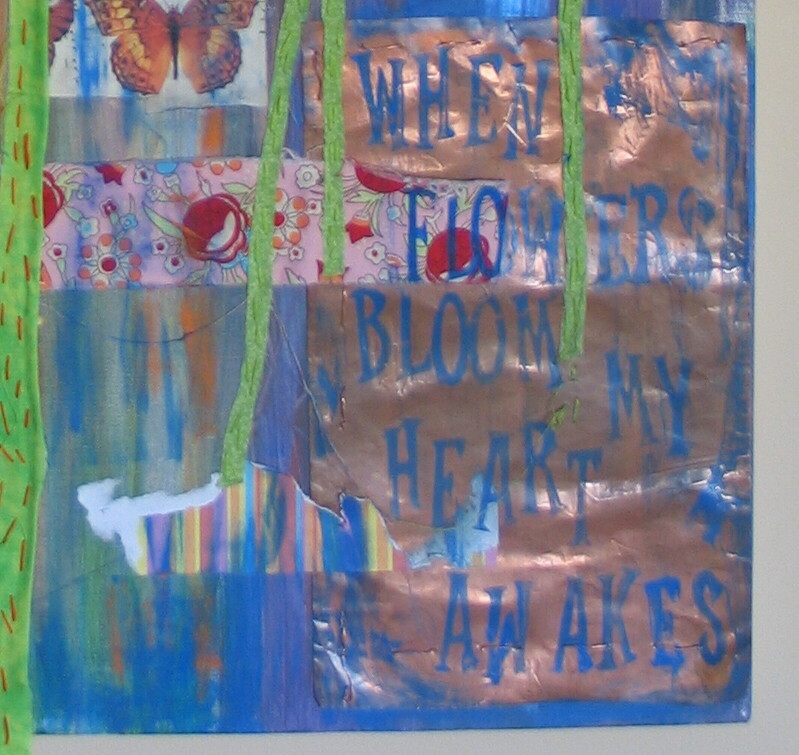 I know from my past few posts I seem a little obsessed with mixed media lately and I have to confess it's been hard for me to train my mind on other things. It's been so much fun pulling out all the supplies I've gathered over the years and playing with them. I've also enjoyed the techniques and the fun of working with the figure again. I am trying to pull my own style into these new works as much as possible and that's proving to be a fun challenge as well. 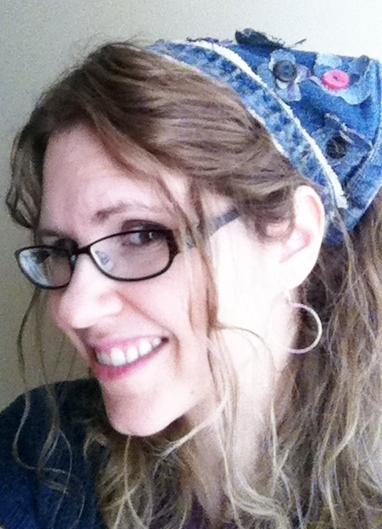 Slowly, I've been adding bits of fabric, some more doodling, some printing, colors, and stitching. Fun! The last week though my production has slowed- a lot. I've had a sick little boy who seems to have recovered just in time for this week's spring break. I've also had the fun of writing a bit and working on some wire for my etsy shop. I am looking forward to being able to spend some more time with the other canvases I've prepped. Maybe later this week. I do want to mention to you that the fabulous Christy Tomlinson of whom I've been gushing is not only offering her She Art Workshop again in April but it's a one time get it all sort of deal. You get all three weeks of videos available to you at once. No waiting. If you're like me and enjoy anticipating something fun then she is also starting up a new online workshop as well. It sounds like SO MUCH FUN!! The first girl I like because of the colors and the side profile, the second though is the girl I'd like to be. She's creative and confident and just a little bit sassy/sweet. The colors are a bit off in the pics they're really bright vibrant images so LOTS of fun to play with. I'll finish the girls and hopefully post those pics soon. Thanks for checking out my work and I hope you have the opportunity to create something happy today too! Stamps, papers, inks, sprays, texture materials, rub-on's and of course, PAINTS! They've all been occupying my mind and my table, chairs, and now floor for a week now. It's all because of the class I'm taking, The She Art Workshop. 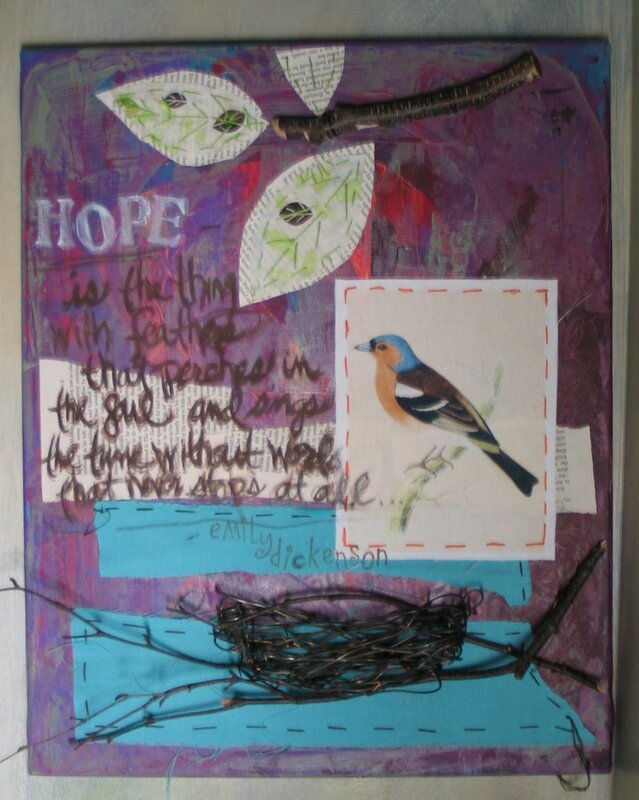 I love how Christy Tomlinson talks us through what she's using as she creates her pieces and because of her background in the papercrafting industry she has a ton of insider's knowledge of how to use all those intriguing art supplies we see. I know lately I've heard a lot of talk about how artists should be making all their own supplies and tools, or risk infringing on other artists' work. There are collage artists who refuse to use those gorgeous patterned papers because someone else designed those papers. Many of the mixed media sites are touting the coolness of carving your own stamps, making your own transfers vs. using the oh so cool rub-on's, creating your own patterned papers and cloth. And I LOVE those articles. I have a secret love for creating my own stamps, I adore using scraps from old prints, and think the transfer thing is about the coolest thing ever. BUT I also feel like eschewing the supplies and materials that are created for our use is just kind of dumb. Personally I love the gorgeous papers, the fabulous printed fabrics, the super cool rub-on's, the amazingly detailed stamps. Truly the only thing stopping me from acquiring as many as possible is the cost and space limitations I have. 1) Do I have it already or do I have something that's similar that can be substituted? Use what you got should be everyone's first mantra. 2) Would it take up a disproportionate amount of space? Is it easily stored? I dream of the Vagabond by Tim Holtz, the Yudu screen printing machine, as well as a new sewing machine but I have no room. 3) Could I make something that does the same sort of thing? I really do love making my own texture stamps. 4) Is it really necessary? I love the cool acrylic wheel that you can stick your clear acrylic borders to so you can just roll them on. BUT to get the same end result I just have to stamp a couple more times with the block. I will buy canvases, I will buy paints and tools and funky cool new ink pens. I LOVE the doilies mixed media kit I ordered from Christy's fabulous online shop. But I will also reuse, repurpose, and reconstruct as much as possible. How about you? Do you have a sweet tip for recreating your fave but off limit art supplies? What do you think about using artist designed tools and supplies in your work? I'd love to know what you think! I e-mailed Jenny back immediately with a "yes" I'd love to, then got back to my Christmas shopping. Two months later and the deadline for my story was approaching and I was just getting to work on it. I thought it'd be no problem, an easy write and it would have been had I just whipped out a pithy little story. But after reading several other curator's stories I realized I wanted to be authentic. I wanted to share my WHOLE story. With you here at the blog, I've gotten used to sharing things, but I still censor myself sometimes. I figure you don't need me elaborating about how depressed I was this week, and really only comment about my depression if it's obviously imparing my ability to relate to you through e-mails, or blog posts. I want to be honest about why I'm not seeming myself but hate to reveal too much too. It was only a short 10-15 years ago that I lost jobs because of my depression, that I lost relationships and was even denied health coverage. Depression is something that has lost a lot of stigma in the last decade but for those of you who have battled with it for longer then that you too probably experienced a lot of this. I learned to hide it, and when it got too bad I learned to hide- period. So my art saves story does let you know a bit more. It shares how I feel and how creating art has helped me put into perspective the truth about who I am. You see, depression not only attacks your self esteem and tells you that you're no good, or people would be better off without you. It also wreaks havoc in your day to day making you seem irresponsible, flippant, or uncaring. It confuses people because they think they know you but then you do something completely out of character. I'd forgotten how much I love working with the human figure and then this week it all came flooding back. Funny how you take a turn in life or in art and in do so leave behind part of yourself for a while. It's not a bad thing, just a turn you're taking. When another turn takes you back to that forgotten or set aside part of yourself it's such a wonderful feeling of homecoming. I've taken a number of figure drawing classes over the years and enjoyed each and every one of them. But when they're done I tend to be done and I leave the figure behind. Because of the She Art Workshop I'm taking online I've returned to the human figure and I'm enjoying it so much. What I love is the way our body movements and gestures can convey a super clear message without words. You've probably all seen the Willow Tree figures that are hugely popular, she doesn't draw faces she just shows figures in different positions and those positions tell a story. I know the no faces thing bothers some people but I think just as many of us like them blank. I like it because then you really do notice the figure and how it's positioned, and because then I can sort of insert my own idea of what that person looks like. Suddenly the sculpture becomes much more personal because I've injected my own vision into it. I hope this makes sense. It's also been super fun to see all the different she girls that all the class participants are making. You can see them too by checking out the official She Art Workshop flickr group here. And here are a peek at my next two girls. I haven't added text to any of them yet, other then a "faith" stamp I added to the backgrounds. It's really been a fun week, and I can't wait for the next two. A couple of people have mentioned that Christy plans on offering this class again in April. If so, I would highly recommend it. It's SO much fun. I'll be back soon with more sneak peeks. Thanks!